Richard III: Hero or Villain? 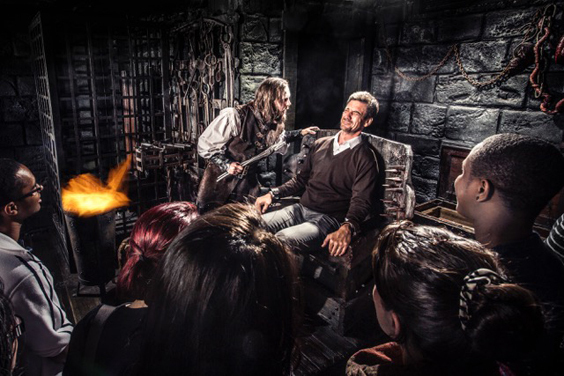 at York Dungeon – Review. It is surely no coincidence that the weekend we visit York Dungeon, this almighty heatwave has been brought to an end by a collection of dramatic thunderstorms and torrential rain. But this is no complaint – the dark skies and rumbling air make us all the more nervous before we queue to see the attraction’s summer hit, ‘Richard III – Hero or Villain?’. 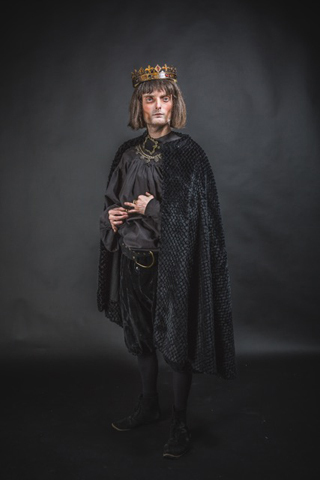 As part of its ‘Yorkshire Rogues & Legends’ series, the Dungeon’s ‘ordinary’ show – taking punters across some 2,000 years of Yorkshire’s history via ten live shows – has been altered to give us unsuspecting peasants an idea of life in the times of Richard III… apparently. As we pass the ticketing desk, we are greeted by a very enthusiastic photographer, handing us placards with details of a crime we’ve been found ‘guilty’ of (luckily, my charge of ‘taking too many selfies’ isn’t punishable by death, we are informed), and stand in front of a green screen for Photoshop magicians to do their work while we make our way round the attraction. Perhaps to give our eyes a time to recover from the flash of cameras, we are plummeted into a dark room immediately afterwards, where we wait for a few moments before we meet the first ‘act’ of the afternoon. Those of a shy disposition should be aware that members of the audience are pulled to the front to form part of the entertainment – and unfortunately for my two pals, they get picked on at least five times between them as we make our way around (much to my amusement). But as we travel first through the times of Jorvik’s Scandinavian rule and then the Black Plague, we turn to each other and ask if we’re in the right place; as we make our way through history, we must encounter the 15th century Yorkist king soon, surely? Alas, we do not. But we do continue to meet plenty of entertaining characters (some more unsavoury than others) with their own tales, with some giving us an idea of how life might just have been during Richard III’s rule and the Wars of the Roses – though this is not immediately obvious to those with a patchy knowledge of the Middle Ages, nor the number of foreign tourists who happen to be in our group. But, knowledge or lack of aside, this is a great opportunity to give young families a brief insight into the many pockets of Yorkshire’s remarkable (and often grim) past via a fun Horrible Histories-style show. It will certainly get them asking plenty of questions, especially if you’re going along to find out more about the last king of the House of York – the answers to which you may discover you’ll have to go elsewhere to find. Questionable accents, often quickly spoken scripts and the hurried nature of the attraction leave us scratching our heads perhaps more than we’d like to admit – and when it comes to a decision on whether or not Richard III was a hero or a villain, we’re certainly none the wiser.